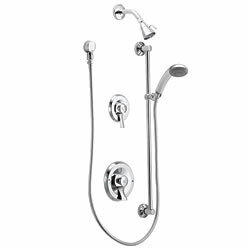 The Adaptive Living Store's ADA compliant, commercial grade package by Moen includes a double handle PosiTemp® pressure balanced vertical spa showerhead and valve with hand shower. Plumbers can install the fixtures and diverter valves appopriately to each individual project. The PosiTemp® pressure–balancing control valve helps maintain water temperature in the shower. Lever handles make it easy to adjust water flow or temperature. The included slide bar makes it easy to adjust the hand held shower height. An overall chrome finish is highly reflective for a mirror–like look that works with any decorating style. Please Note: Slide bar is NOT DESIGNED TO BE A GRAB BAR. Please allow 5 - 6 business days for shipping. Expedited shipping also available, call for a quote.